HOUSTON: One of the major goals of IACAN is to support cancer survivors and their care givers. This provides a buddy system so survivors and their care givers get to share their experiences and hardship and thus come to know that they are not alone in this hard journey. In the survivor activities, they share good nutritional tips for good health, modified exercises, and other valuable information about different resources that are available in the community. IACAN chooses therapeutic activities that would benefit survivors such as painting, yoga, and music and other activities that would help to ease the mind and give them a sense of wellbeing. . Thus, IACAN provides emotional support, psychological and medical support such as second opinions to them. One such activity was held on Saturday, March 9, 2019 at Udupi, Sugar Land, TX. Music heals mind and soul. It soothes the mind, reduces stress and anxiety, elevates the mood, eases the pain, improves cognition, relaxes the listeners and give them a sense of happiness and calm. The audience experienced all these benefits at the music concert conducted by Mrs. Mani Sastri and Mr. Krishna Prasad of Nada VInoda Music Academy. These two artists are not new to our IACAN. They had a fantastic music program last year and due to popular demand, they graciously agreed to treat us this year as well. 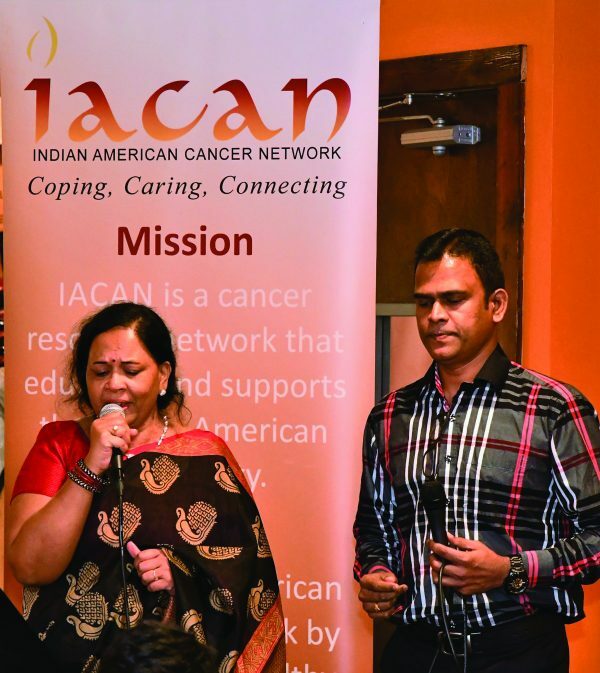 These artists happily support IACAN by conducting music concerts for the survivors and care givers. Today’s program exceeded the expectations of everyone. These singers put their heart and soul when they perform. They choose the best songs – both new and old and fill the hall with nostalgia. Every song is selected with great thought, compassion and excellent taste. So, it is no wonder, the audience enjoyed these songs to the fullest. The program was so enthralling, the participants took on the dance floor and danced for a couple of songs. This was an amazing performance. No program is complete without food. We had tasty appetizers with hot tea. We were treated with sumptuous dinner in the mid program. Everyone enjoyed the meals and as you know the food tastes great when you are sharing with your friends. The music continued after the dinner and when Mani announced the last song, no one wanted her to stop the program. Someone at the audience said that he has attended several music programs and Mani and Krishna’s performance was the best he had the pleasure of attending. Thanks to Vibhutiben, one of our board members for arranging this program to all those who attended. IACAN has more such programs in the pipe line. Please check our website and let us know what kind of programs you would be interested in attending. Let us know your thoughts so we can bring more relevant programs.